The Hilton Corniche Residence is located on Abu Dhabi's magnificent seafront in Corniche. It is almost at a walking distance from the important business and shopping centers and only 35 km from Abu Dhabi International Airport. The hotel is ideal for pure pleasure, real relaxation and busy business meetings. 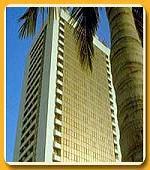 Hotel Hilton Corniche Residence offers two categories of guest rooms, namely, Standard Rooms and Suites. Both the categories of rooms have stylish furniture with plush upholstery, kitchenette and private baths. The rooms are equipped with air-conditioners, work desk with lamp, mini bar, telephone with data port, bathroom amenities and hairdryer. Hilton Corniche Residence Hotel has two restaurants serving scrumptious preparations, which will kill your hunger pangs but the taste will linger till long on your tongue. Café Cappuccino serves confectionery items like cakes, pastries, sandwiches, patties, biscuits and other baked items. Also available are varieties in drinks like coffees, teas, juices and smoothies. The restaurant is open for breakfast and lunch from 7 in the morning till 11 at night. Hamptons is a 'New English Style' Restaurant open for breakfast lunch and dinner. The interior of the restaurant is done using lot of wood with prominent yellow and blue chequered design on cloth. To create a seaside ambiance, wicker baskets, miniature boats and bamboos are used. The restaurant is open from 6 in the morning till 11 in the night. For organizing a seminar, conference or business meeting, Hotel Hilton Corniche Residence is the ideal choice. We have the requisite space, contemporary conferencing aids and assistance of the professional staff. For the health conscious people, w have well-equipped Fitness Center so that you do not miss out on your workout regimen. A lap or two in the pool also works as an exercise for the body. The crystal clear water of the pool looks very inviting. Pamper your body at the beauty salon/barber shop where devoted staff work out to give you a fresh look. Other facilities at Hilton Corniche Residence Hotel include Car Rental Desk, Concierge Desk, Foreign Currency Exchange, Laundry Service, Valet Service, Safety Deposit Box and Round the Clock Rom Service.